DURHAM, N.C. — A new study from Duke University and Fudan University in China is the first to estimate how much Chinese residential electricity consumption would increase due to climate change. It’s a lot. The study, “Climate Change and Residential Electricity Consumption in the Yangtze River Delta, China,” by Yating Li, William A. Pizer, and Libo Wu, appears the week of December 24 in the Proceedings of the National Academy of Sciences. “Our findings contribute solid evidence supporting China’s low-carbon policy by showing how important increasing demand from the residential sector will be,” said Libo Wu, a professor and director of the Center for Energy Economics and Strategies Studies at Fudan. “This state-of-the-art approach has been applied to communities in the United States, but this is the first application in China,” said Billy Pizer, a professor in Duke’s Sanford School of Public Policy and Duke Kunshan University in Jiangsu Province, China. Most previous studies of these impacts have been done in Western countries. 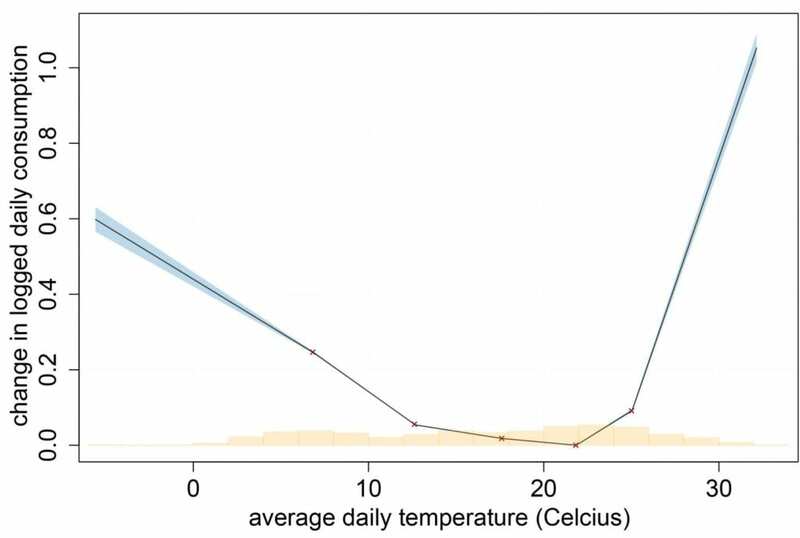 For temperatures above 25 C (77 F), the authors found residential daily electricity consumption increased sharply — 14.5 percent for every 1 C increase in daily temperature. For example, compared with a comfortable 20 C day, when electricity consumption is the lowest, a 32 C day led to a 174-percent increase in daily electricity consumption. The study found that high-income Chinese used more electricity during the winter. However, the response to hot summer days was similar for all income groups in Shanghai — everyone reached for the air conditioning. “If we consider that more provinces would become ‘Shanghai’ as incomes rise, our results may ultimately be more broadly applicable,” said Yating Li, a Duke PhD candidate in environmental policy. The authors believe the results can be applied to other urban areas in the Yangtze River Delta, which have similar climate and economic conditions. This metropolitan region includes Jiangsu, Zhejiang and Anhui provinces, roughly one-fifth of China’s urban population and one-fourth of economic output of China (GDP). This research is supported by the National 863 High Technology Research and Development Program of China (2015AA050203). Li is supported by the Duke University Energy Initiative through the Energy Doctoral Student Fellow program. CITATION: “Climate change and residential electricity consumption in the Yangtze River Delta, China,” Yating Li, William A. Pizer, and Libo Wu. PNAS published ahead of print December 24, 2018.